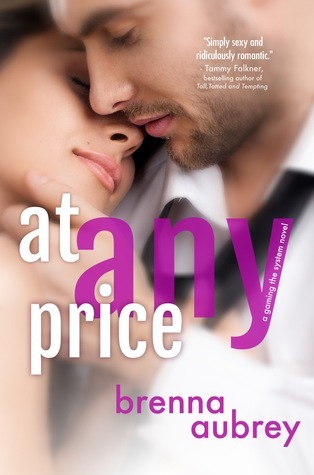 At Any Price is the first book in the Gaming the System series by Brenna Aubrey. It is a full length novel, and it does have a happy ending. 🙂 I’m going to point out though, that the story does not end here! There are books after it about this couple as well. This book and the subject matter made do do the eyeballs…, you know the o.O eyeballs. It also intrigued me though because not only am I an avid reader, I’m an avid gamer. So I wanted to see how a series on gaming could turnout. I can’t say I’m unhappy or displeased! This book was well worth it. The book opens up with Mia and her Manifesto about virginity. This character is not stupid by any means, she’s extremely smart. She is woman working a job, with a very popular gaming blog on the side that pays the majority of her bills. Mia’s also spends most of her spare time studying for a test so she can get into medical school to be an oncologist someday. So you may be like I was, sitting there wondering why in the heck a girl who seems to have it all together, would auction off her virginity like this. Well, I can’t tell word for word, because that would spoil a big part of the book. I will just say that when I figured it out, it made sense. Would I do this? No, not even remotely but do I understand why Mia is? Completely. Adam Drake is a millionaire gamer. Really, he’s not that old but he’s also a workaholic in his mid-twenties. CEO of his own company, and having been the architect of one of the most popular gaming MMO’s out there, he’s used to control. Controlling situations, and people. He tends to get what he wants, although he’s not arrogant about it. He ends up winning Mia’s auction, but let me just say he has ulterior motives. There are reasons why he wants to win it and sets out to… there was never any question to him of who -would- win it. Here is the part that massively threw me, and Mia as well! Adam won the auction, but he doesn’t want to follow through with it. He keeps finding ways around it, so that he can spend more time with her, but never letting anything fully happen, so that he can see her again and again. The chemistry between them is there too, so it leaves you wondering why, repeatedly. I gave the book four starts out of five, I can’t really pinpoint what it was that made it a four for me, but it is a solid four. I’m also going to point out that this is one of the harder reviews I’ve written. I was discussing with a friend even, how in the world I was going to review it because you have to be -so- careful not to give spoilers. It’d be a mine field of them in here. The book was great, the writing well done and I thought the characters were fantastic. The book is basically like an onion, you get more and more layers revealed the more you read into it. Last but not least, as I mentioned in the beginning, the second book in this series is about the same couple, but it’s told from Adam’s POV this time. At Any Price is told completely from Mia’s. I find it an interesting contrast! Previous Post ★★ RELEASE DAY ★★ . :Breaking Her Rules by Jennifer Snow:. I totally agree! I really attempt to keep my reviews spoiler free as well, and it’s SUPER difficult when a certain seen begs to be discussed!